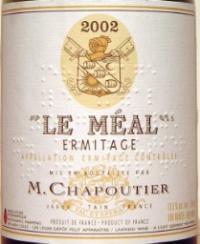 2005 Chapoutier Hermitage Le Meal - $299.99: Vins Rare, The finest selection of rare wines. Wine Spectator: 98 and Collectibles Designation. ($225) A big, broad-shouldered version, with loam, tobacco, currant paste and hoisin sauce notes out in front of the formidable tannin structure. Dark, loamy and muscular through the finish, with a haymaker of black fruit and tarry grip. Best from 2010 through 2030.Â Â 98 points and Collectibles Designation.